Starring: Milla Jovovich, Pierce Brosnan, Dylan McDermott, Angela Bassett, Robert Forster. A note to the film makers: please can we have a spin-off movie. Not with the main characters, or using the same situation. No, can we have a spin-off starring Pierce Brosnan’s moustache! The reason being is that it’s the most interesting thing in this dire, contrived, incredibly dull and routine thriller and I couldn’t wait for its appearance as it randomly showed up whenever it felt like. Security expert Kate Abbott has joined the visa staff at the American Embassy in London, in order to stop a potential terrorist act happening in New York. When the terrorists in question, find out about her, they hire a hitman, The Watchmaker, to kill her. After escaping the first attempt on her life, Kate goes on the run, accused on a crime she didn’t commit, with the Watchmaker getting closer and still desperate to stop a serious disaster from occurring. James McTeigue, who gave us the cult classic, V For Vendetta, knows how to build tension, create atmosphere and produce a decent set piece or two. Here it feels like he was sleeping on the job as we get one long chase sequence that neither excites or surprises. The characters are pretty much one-dimensional and seem only to exist to act as stereotypes. There’s the bad guys with their dodgy, foreign accents; there’s Kate’s boss, who believes her and yet cannot help her; there’s the Ambassador, who, for some reason loves entering rooms and looking stern. Of course, we have the British cops, who have been given guns! It’s all so contrived, as Kate manages to escape both the police and this expert hit man, who manages to kill everyone else apart from the one person he’s supposed to be after. Along the way we are given some truly awful dialogue, still laced with a cheesy pungent stink. Real heroic stuff like “We’re doing this because we believe in an old-fashioned idea of country!” What’s more, lines like that are being delivered by seasoned professionals who should know better. My only reasoning for them being here is because they needed a new pool or an extension to their homes. 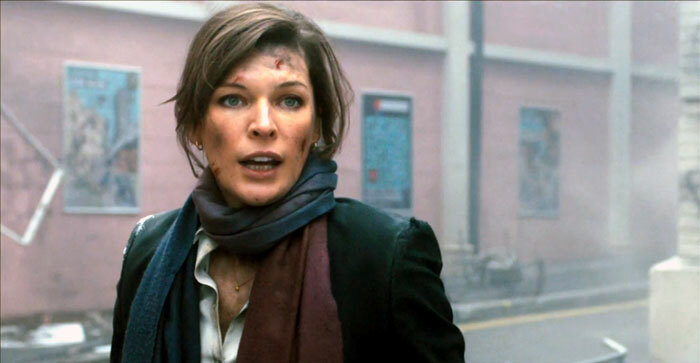 Milla Jovovich handles the action scenes fine but most of the time looks like a rabbit facing headlights as she runs from one bungled attempt on her life to another. Angela Bassett, a perfectly fine actress, plays the Ambassador like she loves entering rooms while Dylan McDermott and Robert Forster just look bored. Even Frances De La Tour, that great of the British stage, is reduced to putting on an unrecognisable American accent. Which leads us to Brosnan. Trying to escape his Bond persona, he goes to the extreme here as The Watchmaker and even though he has the cool-heartedness down to a tee, he is let down by everything else, apart from his moustache. This is an amazing thing. One moment it’s there, the next, gone only to reappear later. If there was any form of tension and suspense, it was whether we would see it again. Survivor has B-movie stamped all over it, except that most B-movies aren’t this bad. It takes a whisper of an idea that we’ve seen time and time again and does nothing new with it, except make you wonder how a hit man like The Watchmaker can be called the best in the business when he can’t even take out one woman! I’m guessing this is one film that the cast will try desperately to forget they where ever involved in.